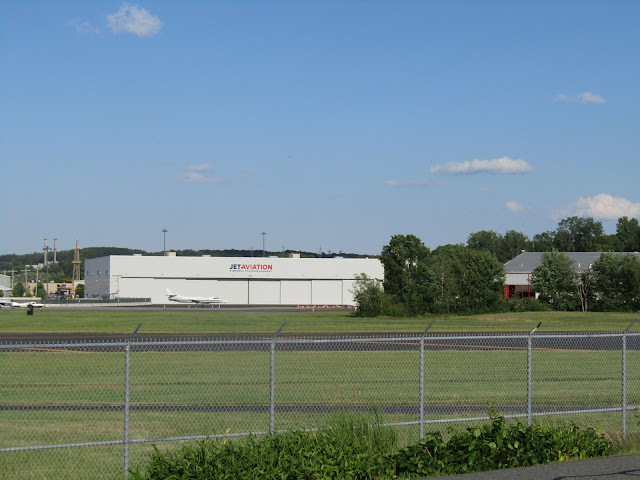 A new terminal building for the Fixed Base Operator (FBO) Jet Aviation is scheduled to open in August at Hanscom Field. As previously reported, construction on the new building started in July of 2015. Adjacent to the terminal building is a new 40,000 square foot hanger which opened last month. Finishing touches are ongoing at the new 30,000 square foot Terminal Building. The new two story terminal building which is LEED Silver certified, includes expanded amenities for Jet Aviation clients that fly in and out of Hanscom Field. In addition to the client areas, the new building contains 16,000 square feet of office and shop space. The new Hanger can accommodate larger aircraft such as a Gulfstream G650. Along with the new terminal building, Jet Aviation has upgraded the ramp area for aircraft along with improvements to surrounding roadways and landscaping. 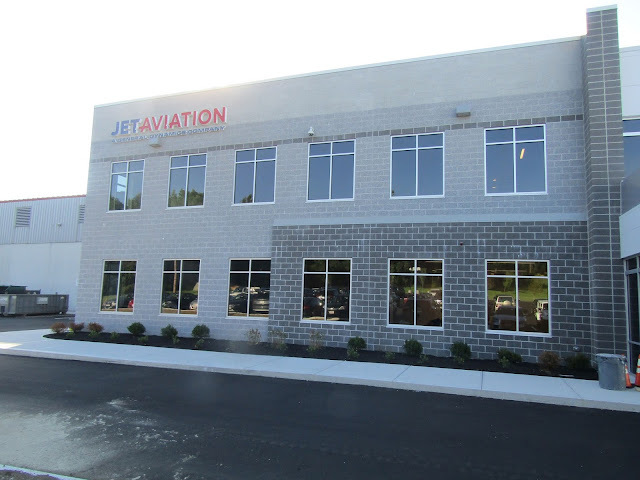 A closeup view of the new Jet Aviation Hanger also known as Building 17. 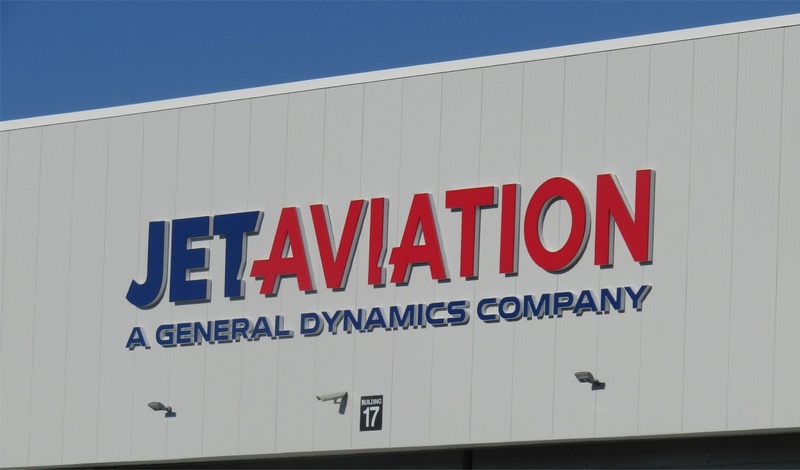 Jet Aviation was acquired by General Dynamics in 2008. The past few years have seen a lot of new construction and activity at Hanscom. Another FBO, Rectrix opened it's new flagship facility in 2014 and last September announced General Electric will move it's corporate flight department (which includes 70 employees, two Bombardier Challenger 605's and two AW139 twin-engine helicopters) to it's facility. In June, Medflight had a groundbreaking for a new $17 million facility at Hanscom. The new 54,000 square foot building is expected to open in 2018. It will be interesting to see if Signature Flight Support (which is the 3rd FBO at Hanscom) decides to upgrade it's facilities. The View from Virginia Road in Concord. 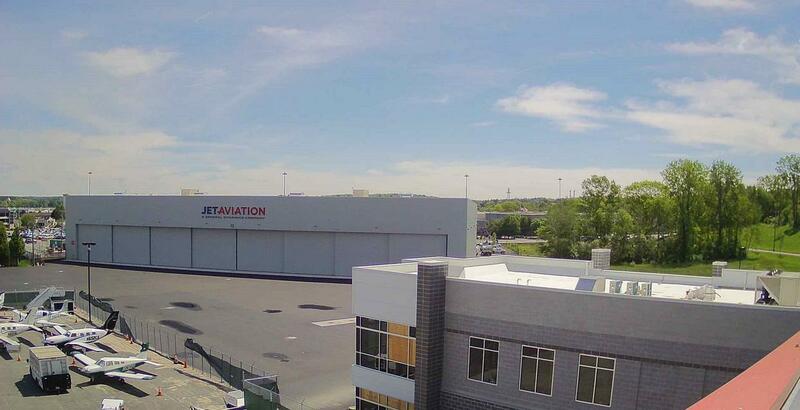 The New FBO Terminal is just to the right of the Jet Aviation Hanger. The more modern facility replaces a 30 year old building. Stay tuned for more details on the new Terminal Building in August.